Eoin Colfer is my new favorite person. 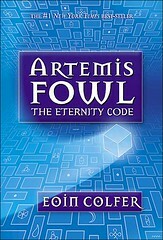 The Artemis Fowl series is quite possibly the funniest, most action-packed young-adult series available right now. Lauren and I are behind in our reading; the fifth volume in the series came out this week, and we’ve only just finished the third. But we’re not wasting any time. We’ve already purchased the remaining two. The stories surround the now thirteen-year-old criminal mastermind Artemis Fowl and his interactions with the People, or the magical fairies and beings who live below us and who operate technology far beyond our own. Colfer is a master of character creation. I love Captain Holly Short, the LEP (short for leprechaun) police officer who enjoys a love hate relationship with the little trouble maker. And then there’s Butler, the immense bodyguard with a heart of gold who takes a bullet for Artemis in this book. Oops. I’ve said too much. You must read it for yourself. Post haste. A.